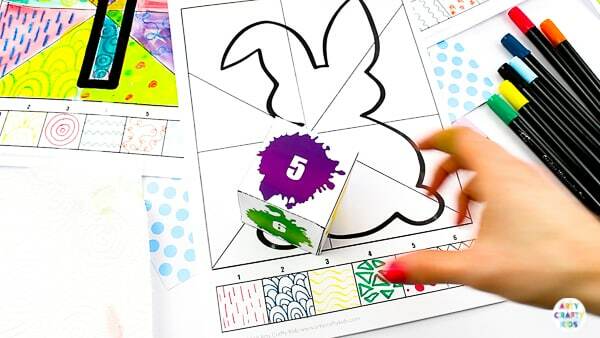 This Roll the Dice, Draw and Colour Kids Easter Activity, pairs art with numbers to create fun and creative game that kids will love. 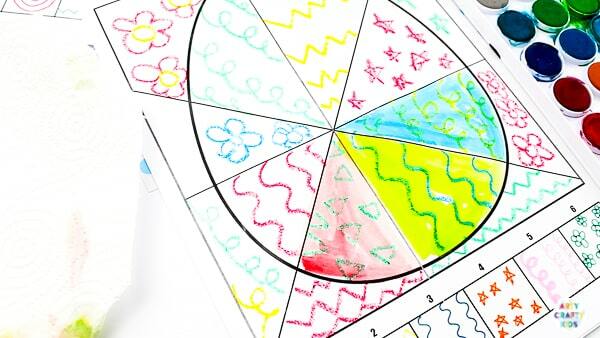 Arty Crafty Kids will complete their Easter designs by rolling the die and filling each empty segment with a corresponding pattern they have designed! 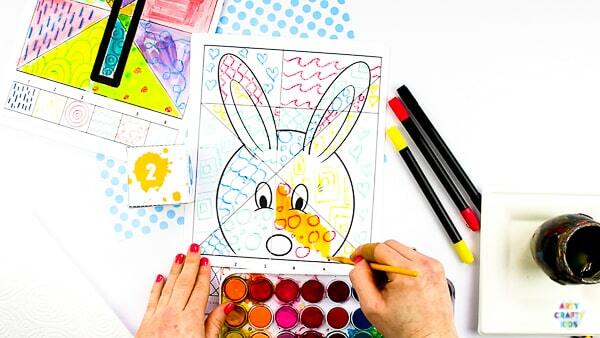 With a choice of five printable Easter themed templates AND a printable paint splat dice, this Easter Activity requires very little prep – simply add colouring pencils! 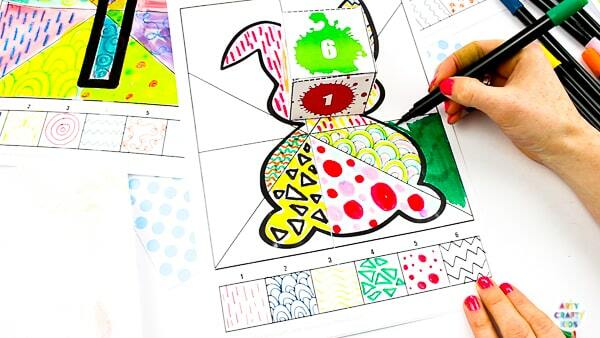 The process will challenge your Arty Crafty Kids creativity from the offset and the dice element creates an element of surprise. For example, colour combinations might be created during this process that are outside of their preferred colour palette. 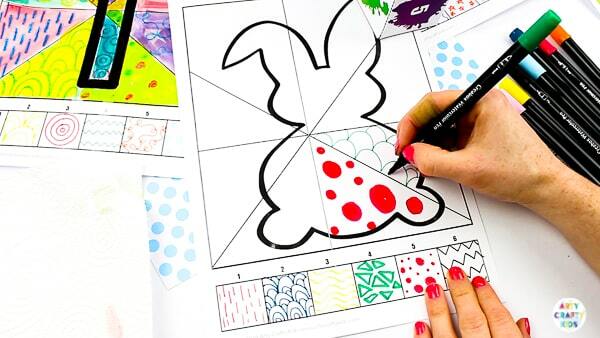 We are offering 5 printable Easter themed designs for our members to download individually or as a collection. 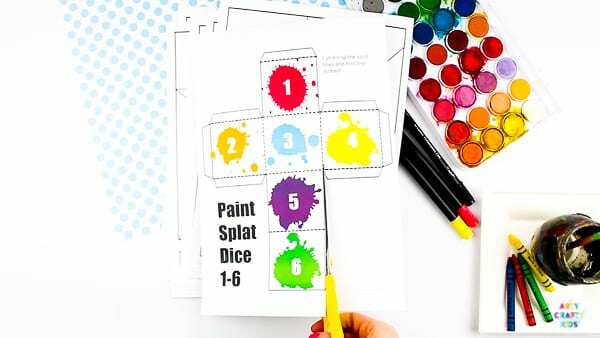 Each design is paired with our printable paint splat dice! Following the solid lines, cut out the dice. 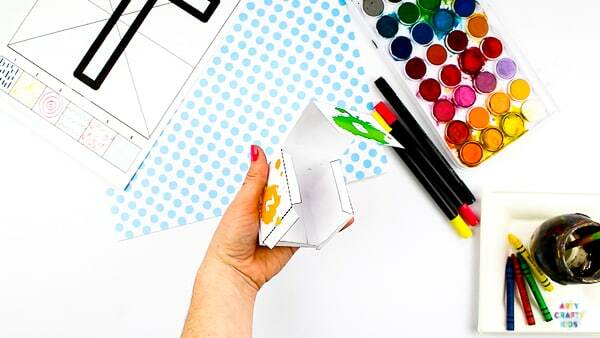 Fold along the dashed lines to create a cube. Add a dab of glue to the folds to secure. The dice is ready to roll! Start by designing a collection of simple patterns within the numbered boxes. Choose a segment of the template. Roll the dice and fill in the white space with the corresponding pattern. Continue rolling the dice for each empty space, matching the correct number and pattern. 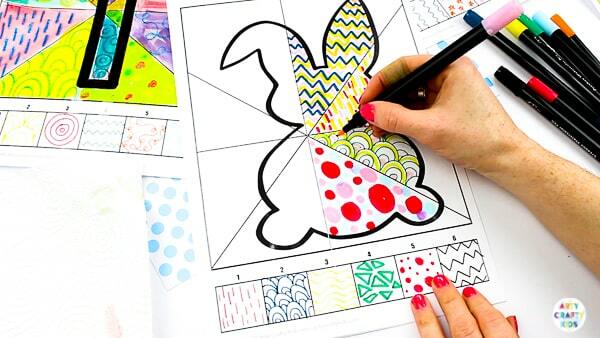 How your Arty Crafty Kids decide to fill the segment with their patterns is entirely up to them. They can be kept simple with one colour (perhaps matching the colour of the dice) or layer the design with lots of colours. 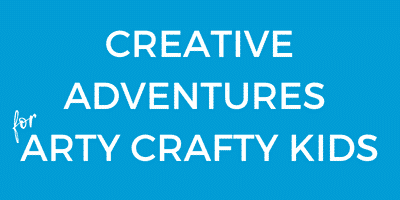 This is an opportunity for kids to immerse themselves in process and use their creativity. Don’t be surprised if each segment becomes more extravagant than the previous! 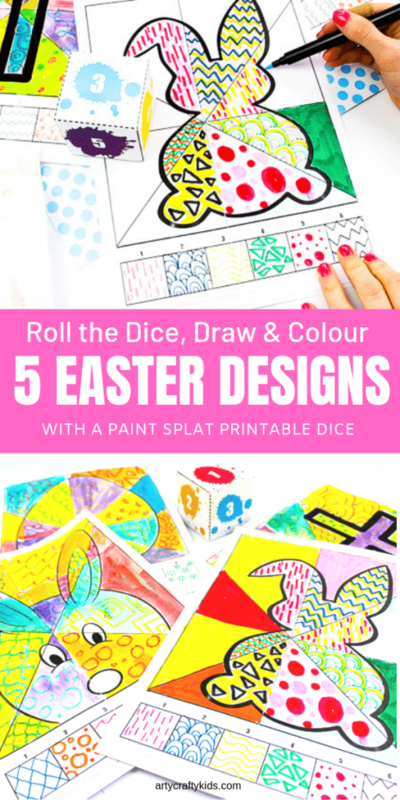 OPTIONAL: As an extra, Arty Crafty Kids could leave the area outside of their Easter shape free and roll the dice again taking note of the paint splat only. This is an easy way to create contrast and help their design POP from the page! Let’s try the Crayon Resist and Watercolour Process! 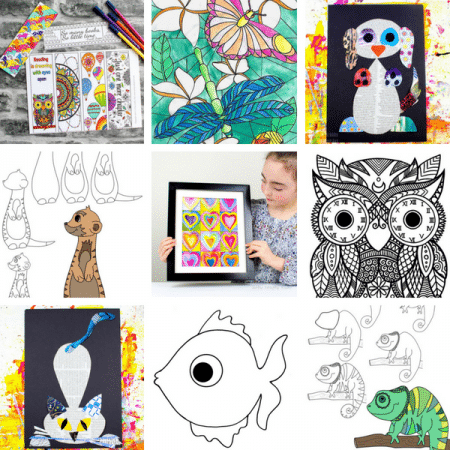 As an alternative to pen and pencil, Arty Crafty Kids may use the templates to explore the Crayon Resist and Watercolour Process. 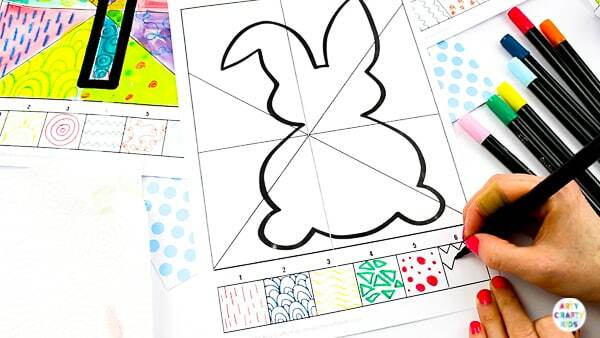 Fill the template with patterns drawn with crayons. A white crayon will create an element of surprise, revealing itself once painted. 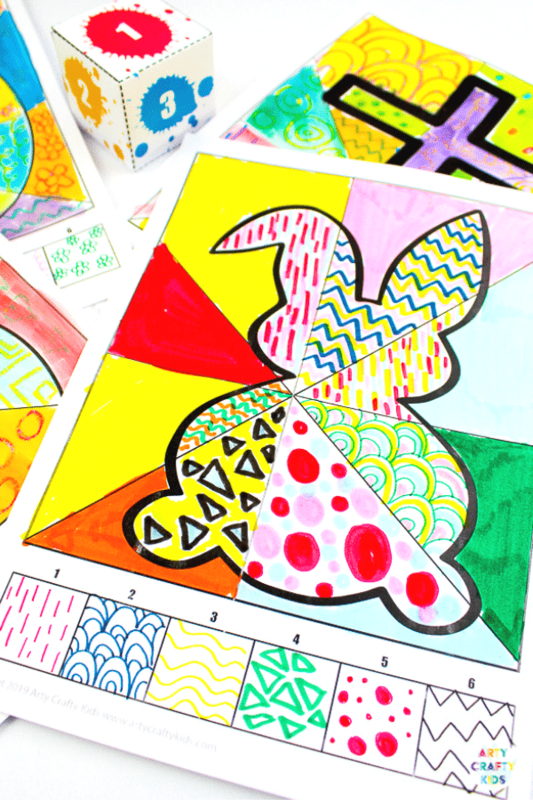 Arty Crafty Kids can also use multiple colours. 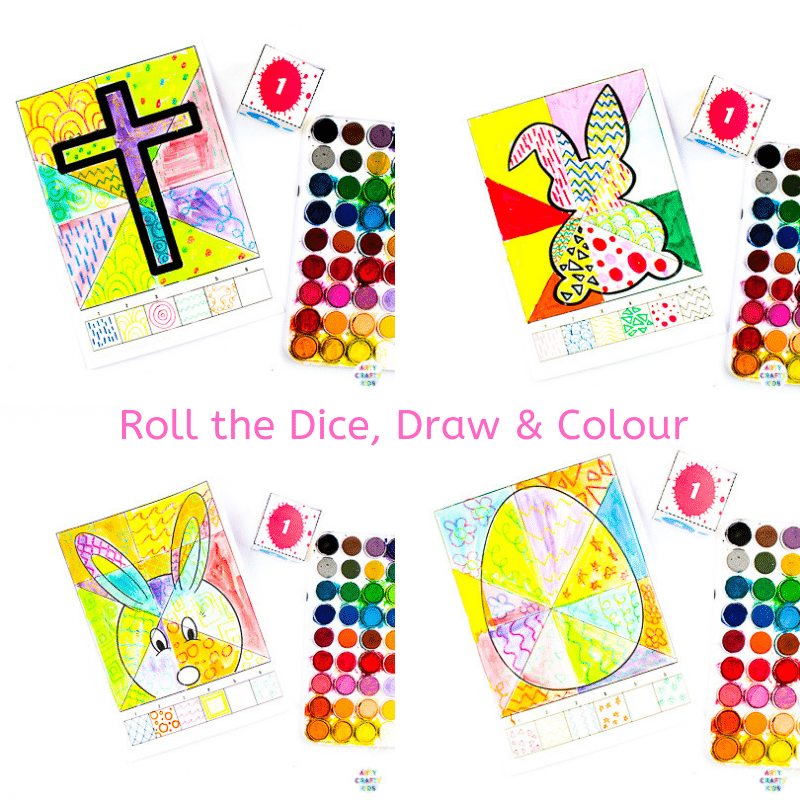 Once your Arty Crafty Kids have completed their patterns, roll the dice to select a colour for each segment. Apply watercolours by wetting the brush and dampening the paint. Wash the paint of over the pattern. The crayon will repel the paint, leaving the design in tact and creating a fabulous bold contrast against the watercolour paint. Designed for Educators and Parents, with new content added weekly! 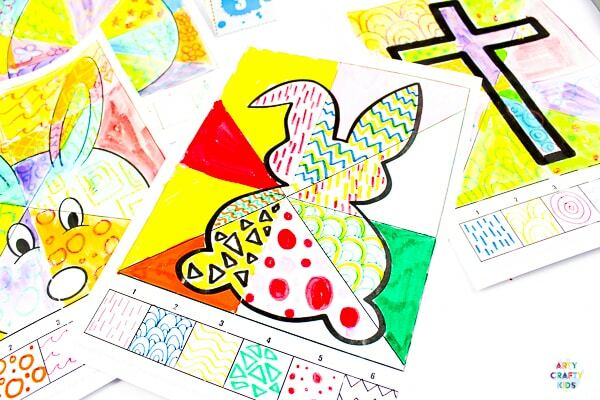 I hope your Arty Crafty Kids enjoy this Roll the Dice, Draw and Colour – Kids Easter Activity and create some beautiful designs! While you’re here, check out our most recent posts!